Patients who are hypercarbic, hypoxemic or both often require emergency ventilatory support. The initiation of positive pressure ventilation following rapid sequence intubation can be life saving. Yet there are significant risks to these procedures. BiPap (actually a trade name) consists of providing by face mask or nasal mask (nasal is often better tolerated) an increased airway pressure during inspiration and a lesser baseline pressure throughout expiration. Patients who are candidates for or placed on BiPap require close observation as well as monitoring of heart rate, respiratory rate, blood pressure, oximetry, and continuous waveform capnography. The equipment and medicines for rapid sequence intubation should be prepared in case it becomes necessary. BiPap is contraindicated in patients who can’t cooperate, who are apneic, or who cannot protect or maintain his airway. A way to think of BiPap is as continuous positive airway pressure (CPAP) along with inspiratory pressure support. The airway pressure during expiration is termed EPAP (expiratory positive airway pressure) and is analgous to CPAP (continuous positive airway pressure) or PEEP (positive end-expiratory pressure). The airway pressure during inspiration is called IPAP ( insperatory positive airway pressure). It is an increase in airway pressure during inspiration above that of the EPAP which can be thought of as the baseline pressure the system is always delivering. First, explain the process to the patient. 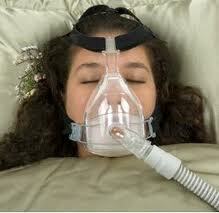 Then, apply the mask and initially use 3 to 5 cm H2O of CPAP. Let the patient hold the mask against his face first, and if he tolerates then secure the mask with straps. Then explain to the patient that the pressure will change periodically and then either sequentially increase the CPAP by 2 to 3 cm H2O every 5 to 10 min or initiate Bi-Pap to support respiration. –EPAP of 3 cm H2O for a pressure support (IPAP – EPAP) of 5 cm H2O. (1) Manual of Emergency Airway Management 4th ed, 2012. RM Walls and MF Murphy, pp. 54 – 58. This entry was posted in Advanced Cardiac Life Support, Advanced Trauma Life Support, Airway Management, Emergency Medicine, Pediatric Advanced Life Support, Pediatrics, Pulmonology. Bookmark the permalink.